I just tried the Invisibility pickup in Monster Hunt. It works if you don't go to close to the monsters. With it you can creep through a map part without be recognized. But my first thought was: makes it sense? As soon as I am shooting monsters they follow my way. Also many servers set value on killing all monsters and not to reach the monster hunt end as first. This can be a reason why Insivibility isn't available in all servers. Can Invisibility be used tactically? Are there situations where this pickup is very useful? Perhaps it's only a pickup that brings some more variety into the game mod? Standard UT-invisibility in MH is doable though not practical as you're really only invisible for about 20 seconds; I usually play on GINORMOUS maps. As you noted, it works okay but the moment you shoot, all the monsters know where you are. 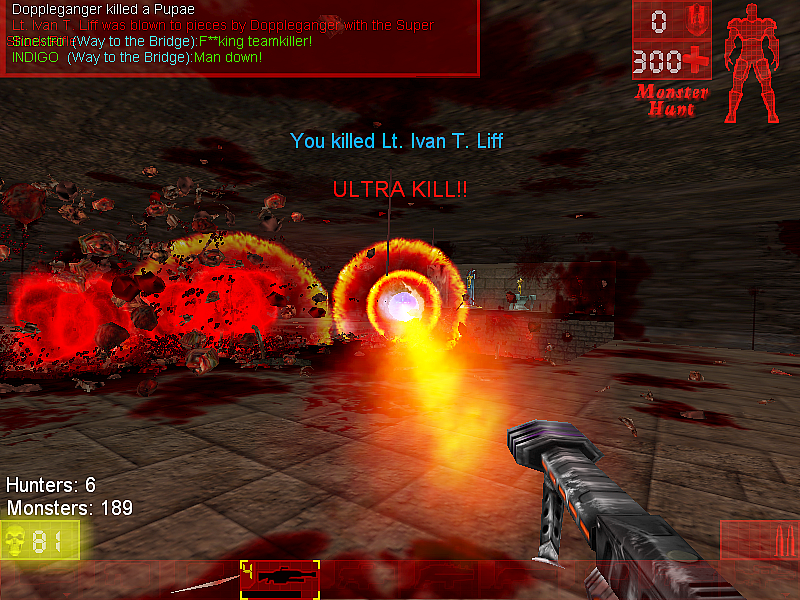 I frequently play with the Oldskool mutator running, which uses the Unreal1 invisibility. Difference is only the monster or monsters you shoot know where you are after you've shot them... but you can get close to any that you didn't shoot and they still don't register you're there. Also, the U1 invisibility doesn't make you shimmery and clear... you become totally invisible, though the world around you takes on a blue-ish tinge from your perspective. Hmm strange, I never noticed a crash here because of Invisibility using the NW3 version of it. But seldom my server crashes too, so I can't be 100% sure. Evilgrins wrote: but you can get close to any that you didn't shoot and they still don't register you're there. That's what I would wish for my (NW3) Invisibility, that only monsters you shoot at can follow you. Then using it would makes more sense. I did not see problems with UT_Invisibility but for sure UT_Stealth combined with something did seldom crashes. As a personal opinion: For MonsterHunt I find Invisibility any mainly useless - after some years of blabbering in this game-type. If you have to kill X number of monsters, when you are opening fire they will figure you not based on SeePlayer but LineOfSight which... is different + CanFireAtEnemy both of these have nothing to do with any Invisibility, definitely they can shoot you. And then if they cannot see you and you kill them easily, there is no sport and it's just a waste of time. Not everyone plays with FF set to kill others on your team. It's a good thing bots don't typically seek revenge. ...that can lead to problems.